Josie Carey was a pioneering host of children's television shows, a lyricist, singer, actor, and theater director. She co-wrote 68 songs with Fred Rogers and sang them on the award winning television show “The Children’s Corner”. The Children’s Corner launched Pittsburgh’s second TV station WQED and was aired nationally on NBC and the NET network. Working with Johnny Costa, Joe Negri, and Sterling Yates she co-wrote songs for her KDKA-TV televisions show “Funsville” and “Josie’s Story Time”. She was seen on KDKA-TV 7 days a week and also had a Sunday radio show on KDKA radio. In the 1970s her children’s show “Wheee!” was aired on 9 stations in South Carolina, North Carolina, and Georgia. Her best known songs from her television shows are "Goodnight God", “Tomorrow”, "It's Morning," and the Children’s Corner theme song "Why Hi, Don't I Know You?" Millions of Children in the Pittsburgh area and around the country enjoyed her lyrics and delightful performances. Born Josephine Vicari in 1930 she grew up in Butler, Pa. Her mother and grandmother ran several restaurants and a hotel in Butler. As a child she put on plays with her friends singing, dancing, and telling stories. Her idol was Judy Garland. She studied voice, piano, and dance. After high school she wanted to study theater at Carnegie Tech, but missed the auditions. Instead she attended Duffs Institute to learned typing. She became a secretary at a Pittsburgh advertising firm that produced live television commercials. Needing someone to help with a new show Josie became an associate producer on the live half hour Dumont TV show ‘Ask the Women”. She organized the props for the commercials, was a hand model in the ads, and selected from viewer letters the questions asked on the show,. In the evenings she performed at the Pittsburgh Playhouse in productions with her friend Shirley Jones. One evening Dorothy Daniels, who was founding an educational TV station, heard Josie sing a song about “teeter-tooter tessie” in a musical at the Playhouse. Daniels came to see Josie and asked her to do a children’s show on her new station. Josie began at WQED as a secretary to Dorothy Daniels in 1953 six months before the station’s first broadcast in 1954. WQED was to be the second TV station to go on the air in Pittsburgh. It was the first community-sponsored television station in the United States. Josie initially worked on fund raising for the non-profit educational station. While planning out her new children’s show another WQED employee named Fred talked to Josie about his ideas. They decided to collaborate and got Daniels permission to work on the show together. Daniels assigned Josie her television name Josie Carey. Fred became the music director and co-writer with Josie. The Children’s Corner” launched in 1954. It quickly became a hit in Pittsburgh brining in vital donations to keep WQEQ alive. In 1956 “The Children’s Corner” won the Sylvania Award for the best locally produced children's program in the country. Josie hosted The Children's Corner on WQED for 8 years from 1954 to 1961. Josie as the on screen host taught her young viewers lessons on good manners, foreign cultures, languages and other social skills. She sang original songs on the show to Fred’s piano accompaniment. Together Josie and Fred co-wrote 68 songs for the show. Josie wrote the lyrics and Fred set them to music. The first song that they collaborated on was the "Children's Corner" theme song, "Why Hi, Don't I Know You?". Fred Rogers became the puppeteer of “The Children’s Corner” when he created the character Daniel Striped Tiger by one day popping him out of a coo-coo clock to announce the time. Daniel was named after station manager Dorothy Daniel who had given the puppet as a present to Fred. Josie held ad lib conversions with Daniel to fill time between the show’s segments. Over time Fred created more puppet characters including King Friday XIII, X the Owl, and Lady Elaine. Fred rarely appeared as himself on camera. The Children Corner was the fore runner to Mr. Roger’s Neighborhood. Many of the songs and characters used on Mr. Rogers Neighborhood were developed for the Children’s Corner by Josie and Fred. NBC officials who visited WQED to see a taping of a show by Dr. Spock were impressed by the “Children’s Corner”. Needing a summer replacement show for Paul Winchell, NBC asked Josie to and Fred to do a few shows. After the first show NBC received 138,000 letters asking for more episodes. NBC syndicated “The Children's Corner” nationally for 39 weeks. Josie and Fred Rogers flew to New York on Fridays and performed the show live for a half hour on Saturdays. While they were appearing on NBC the singer Teresa Brewer asked to record Josie and Fred’s song “Goodnight God”. They signed away the publishing rights to that song and several others when Brewer’s record label issued two albums of music from the Children’s Corner: “Around the Children's Corner” and “Tomorrow on the Children's Corner”. After seeing Josie on NBC, KDKA-TV hired Josie to do an 8 o’clock morning show called “Josie's Storyland”. For two years she did her KDKA show in the morning and “The Children’s Corner” on WQED in the afternoons. Pianist Johnny Costa was her music director at KDKA. Josie introduce Costa to Fred when Costa appeared on the NET “Childern’s Corner” series. 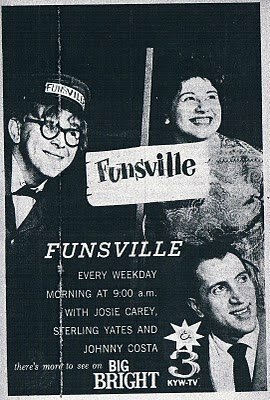 Leaving WQED in around 1961, Josie hosted a live half hour afternoon children’s show on KDKA-TV called “Funsville. Running five afternoons a week, Funsville was a zany after school favorite of Pittsburgh baby boomer kids. Pianist Johnny Costa performed jazzy music and played the silent character Indian Mary. He wore a skirt, a shirt, and a wig with pigtails. Josie described the wise cracking piano playing Costa as being “all three Marx Brothers rolled into one”. To keep Costa from making wild statements on the live show, they made him keep a cigar in his mouth. On the air Indian Mary would hold conversations with Josie by playing notes on a celesta keyboard. KDKA radio DJ Sterling Yates was the puppeteer and voice of the characters including the little monkey Fenwick Bit-A-Bit-Bit. Yates also played the eccentric character Mr. Wrinkle who wore an idea hat containing idea cards. He had a secret laboratory with a magic window. Josie described the show as silly with Sterling always going for the joke. Yates and Costa co-wrote songs with Josie for Funsville. The show ended every day with Josie singing the catchy song “Tomorrow”. For several years Mr. Rogers also ended Mr. Rogers Neighborhood with “Tomorrow”. Each Christmas season Josie and Mr. Wrinkle did a daily 5 minute Santa Clause segment. Mr. Wrinkle would pick up letters to Santa from Joise’s viewers and would fly off in his rocket ship to deliver the letters to Santa at the North Pole. Santa was played by jolly old Ed Shaughnessy. Each year Mr. Wrinkle helped Santa save Christmas from some calamity. Syndicated on the Group-W network Funsville was also aired in Boston, Cleveland, and Baltimore. Josey also did shows on Saturday mornings and Sunday on KDKA TV. She also had a Sunday DJ slot of KDKA Radio playing her favorite music. In 1966 KDKA replaced “Funsville” with reruns of the “Rifleman” so that children could watch Chuck Conners gun down people everyday. Silly jokes, zany puppets, fun songs, Indian Mary, and Mr Wrinkles were replaced by "Hey Pa" and gun fights. Josie Carey returned to TV hosting the syndicated show “Wheee!” from 1972 to 1976 from a South Carolina public TV station. Josie commuted from Pittsburgh to tape the show. It aired on a nine station educational network in South Carolina, North Carolina, and Georgia. She took a break from television to deal with the death of her first husband and to raise her daughter. Josie returned to WQED in the 90s to host “Josie's Attic” on it's sister station WQEX. She was active in local theater productions as a director and actor. Josie passed away at age 73 in 2004. Pittsburgh kids were glad she sang "Why Hi, Don't I Know You?" and became their TV friend.